A rendering of the proposed SoccerCity stadium. Courtesy FS Investors. San Diego City Attorney Mara Elliott on Wednesday praised the League of California Cities’ recent move to join her office in trying to prevent the SoccerCity and SDSU West citizens’ initiatives from appearing on the November ballot. The City Council voted last week to back Elliott’s appellate challenge, asserting that the measures force the lease or sale of city assets on terms set by the proponents. On Tuesday, the league filed amicus letters to the Fourth District Court of Appeal arguing the measures are “invalid” under state law. The league, composed of 24 city attorneys, monitors litigation and other government policy issues around the state. The initiatives would force the city to lease or sell property at terms unfavorable to the city, which would interfere with “essential municipal functions,” according to the league. The SDSU West proposal to develop the Mission Valley stadium site calls for a new 35,000-seat Aztecs football stadium. It also includes hotels, retail space, a river park and an academic campus to be shared with commercial office tenants. 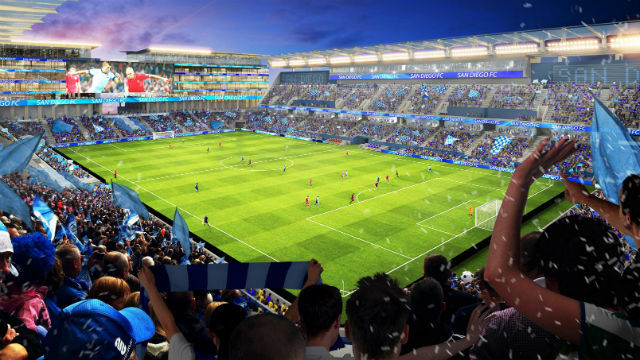 The competing SoccerCity initiative also proposes mixed-use spaces, as well as a 23,500-seat professional soccer stadium that could be expanded to accommodate Aztecs football. Provided they make it to the ballot, supporters of whichever measure receives more votes in November, provided it cracks majority support, may be given an opportunity to negotiate with the city over the land.